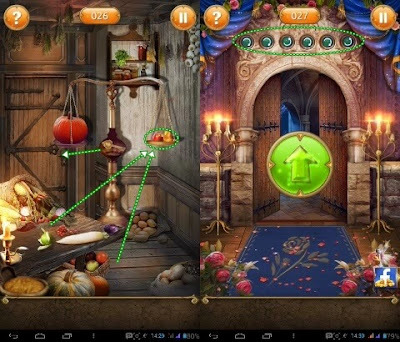 Move the guava, apples, and pear on the table and on the floor to the right scales so that a key appears on the scales pole and pull the key into the door handle. Notice the direction of the arrow on the circle at the top of the door as a guide. Rotate the wheel on the door according to the direction of the rotation of the arrow, right 2 times, left 1 time, right 2 times, and left 1 times. 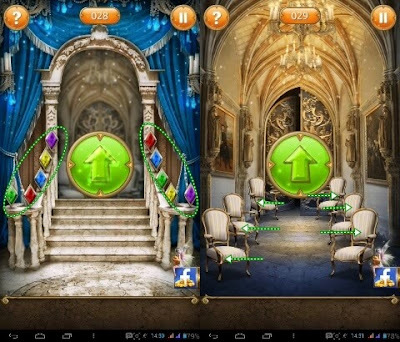 See the color sequence in the door from top to bottom, then change each diamond color on the pillar in the order of colors on the door. Slide all the chairs to the left and right quickly until the door opens. Wait and see the order of the glass vibrating on the table, then press each glass in the order of vibration.